• To promote a feeling of national unity, secularism and patriotism among children belonging to different backgrounds and religions. • To develop among children the quality of leadership. • To broaden their outlook and to provide them with opportunities to know their potentials. • To cultivate the interests of children in academic, cultural and social activities and develop their talents through various activities. • Scouters from grade7, 8 and 9 were selected. • Parents’ meeting was held for giving all detail information about the camp. • Scouters practised 3 dances in order to perform. • 10 participants including 8 students and 2 teachers gathered in EES premises at 10:00 am and departed at 12:30 pm in school bus. • Headed towards the destination, Little Angels’ School, Hattiban and arrived there at around 1:30 pm. • Even though Paban sir was supposed to manage accommodation, it was already settled by LA management team. • With the luggage, girls stayed in girls’ hostel, boys in boys’ hostel and teachers in the rooms allocated. • Everestians were taken out for lunch(momo). • We welcomed Bidhya Sagar School, Kavre at around 2:30 pm and Chitwan campers at around 8 pm. • Waited foreign campers but they couldn’t arrive. • Preparations for the inauguration ceremony were done. • Mr. Bimalendra Nidhi, Home Minister of Nepal inaugurated the camp at 3:30 pm in presence of many other delegate personalities. • Kumari dance and Namaste Byayam were performed by the Everestians. • All the campers were given the instructions and were divided into four patrols each with a leader. • Visited World Heritage sites, Boudhanath Stupa, Pashupati Nath Temple, as well as Guhesori Temple. • Enjoyed beautiful snow-capped mountains from Nagarkot. • Warmly welcomed by the Indian Embassy where the representative of the ambassador blessed our campers with an inspiring speech. • Reached Swayambhu Nath Temple with great excitement and observed Kathmandu valley. • For lunch, happily moved towards our school,Everest English School, Bhaktapur as we had sponsored. • All the campers visited Everest School. • Friendship tree was planted at the Everest premises including representatives of India, Mr. Maity,Bangladesh, Mr. Nazu and Mr.Bhakta Rajbhandari which strenghthed the relationship. • Token of love was gifted to representatives of Chitwan, Kavre, Bangladesh and India. • Preparation for the passing out ceremony was done. 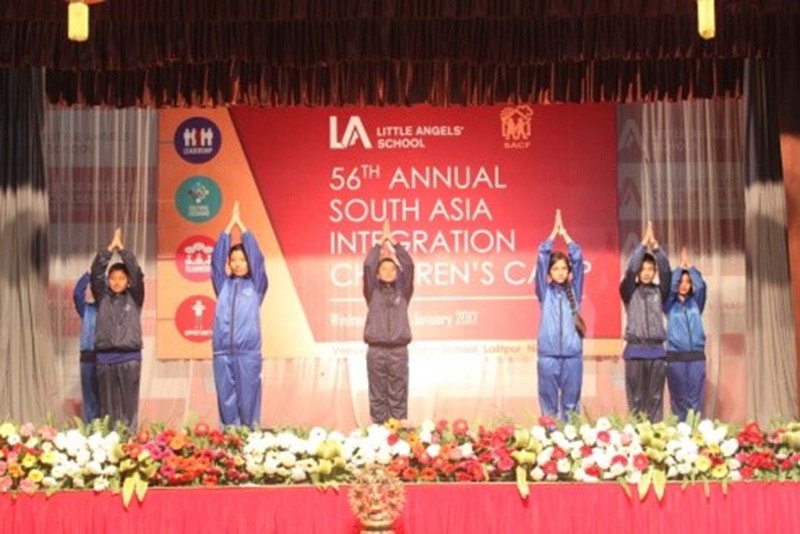 • The closing ceremony was conducted with Mr. Mukunda Sharma, Principal of Little Angel’s School as the chief guest. • Thanked Little Angel’s team for the great hospitality. • Group dance was performed by Everest Scouters. • Got blessings from Founder Principal of Little Angel’s School, Mr. Umesh Shrestha. • Wished each other good luck and safe journey. • Fare welled foreign campers and departed from there with the troop of Kavre at around 1:00 pm. • Promoted a feeling of nationality and patriotism. • Developed the leadership quality among children. • The camp and excursions were entertaining. • Cultivated cooperation with South Asian Countries citizens. • Dipana Pradhan was awarded as the best girl camper. • Ritika Chawal was awarded as the best girl performer. • As Salina Bajracharya was the master of ceremony, she was praised for her performance. • All the participants were certified the certificates for successfully completing the camp. • According to the schedule, Indian and Bangladesh campers were to arrive on 2073/09/19, but due to visa issues of Bangladesh campers, they couldn’t arrive and 3 out of 12 Bangladesh campers returned to their place. • Very sadly, Bangladesh campers weren’t allowed to visit Pashupati Nath Temple. • Head Representative from India, Mr. Jyan Maity hurted few of the Indian, Nepalese and Bangladesh officers for various unknown reasons which didn’t bring positive vibes in the camp. • Schedules and rules weren’t being properly followed like, using own dishes/cleaning it, punctuality etc. • Because of educational strike, our school bus couldn’t pick us on 2073/09/26 and reserved a local bus with the group of Kavre. • All the schedules should have been strictly followed. • Inspite of just visiting various places, various activities should have been added for campers to build friendship. • These kind of programs should be organised in future as well. • The program helped the campers to inculcate a pattern of life for them where work, play, entertain, study and built harmony.